Nirdesh Singh, Author at Ghumakkar - Inspiring travel experiences. always be a knot in it. The friendship will not be same anymore. Now, that sure brought an instant childhood connection with Rahim and a smile to the face. Abdul Rahim Khan was the son of Bairam Khan. History is amazing – how can a son of a Mughal general infamous for atrocities could turn out to be composer and poet. Legend has it that Alauddin beheaded 8000 Mongols living in the settlement now called Mongolpuri and built the foundation of his City on these heads. Thus the first Muslim city of Delhi was built in 1303 and called Siri (‘Sir’ is Hindi for head) as a homage to all the severed heads. In fact, Khilji chased the Mongols and pushed them north of Kabul that ensured the Mongols would not attack India again for some time. Sitting in a restaurant on the Mall Road, you feel happy. The early December air is nippy, fresh and clear. There are few tourists this time of the year. Sun rays reflect off the dark green water of the lake creating silvery ripples. Wisps of clouds float in the incredibly blue sky. Such blue skies are seen over Delhi for maybe two days a year. You have chosen to sit in the open sided area. The sun is soothing. You are almost in a trance. It seems life has receded leaving you in a glowing fuzzy ball of warmth. And then you see the tree. After wandering around the hill, you are drawn back to the crown jewel that is the Stup 1. 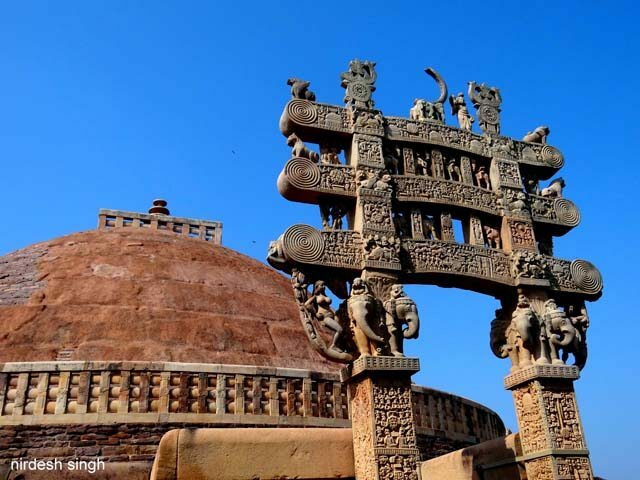 The four magnificent gateways with their exquisite carvings are the main attraction of Sanchi and its trademark. The stup was embellished with the eye-popping carved torans in the 1st century BC by the Satavahans. Satavahans were the right people with the right credentials for the job. They gave us the glorious Ajanta temples. You are just relieved that the torans have survived for over two thousand years in almost pristine condition. Of course credit goes to Cunningham and Marshall for the restoration efforts. The four gateways are installed at four cardinal directions of the stup. They have a common design – two square pillars with capitals and surmounted by three parallel architraves. All sides of the columns and the rear and front of the architraves are profusely carved. You could mistake the carved panels for wood or ivory. A lot of carving is overlapping and would require highly skilled workers. Reportedly, the workers were ivory carvers of Vidisha. The first thing that comes to mind when you think of Kutch is the Rann. In visuals you have seen it as white, featureless and stark landscape where not a blade of grass grows. 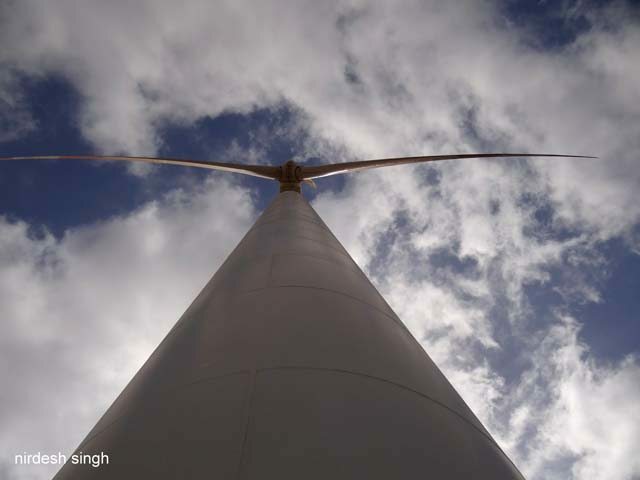 Quick research of net has shown that you can enjoy two views of the Rann. 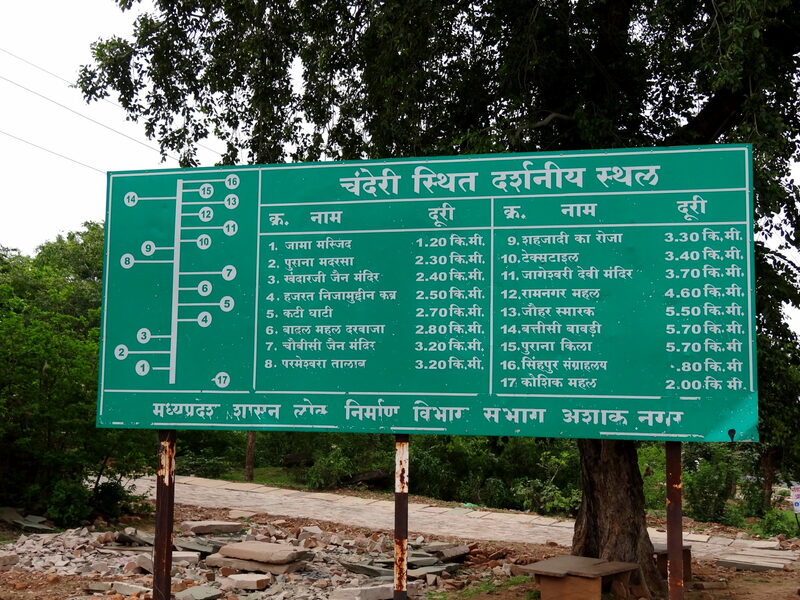 First the aerial view from top of Kalo Dungar and the second is to actually walk on the white terrain at the same site where the annual Rann Mahotsav is held during full moon nights in winters. It is May and hot. You have few hours only and have started early and are now racing north. The driver wants to take the car aerial but you have to keep reminding him that you want to see Rann only from a few hundred metres up and not all the way from the top! Just looking at the long line of tombs you know the big daddy is the Ahmad Shah I Wali Tomb. The tomb is the second from the east. 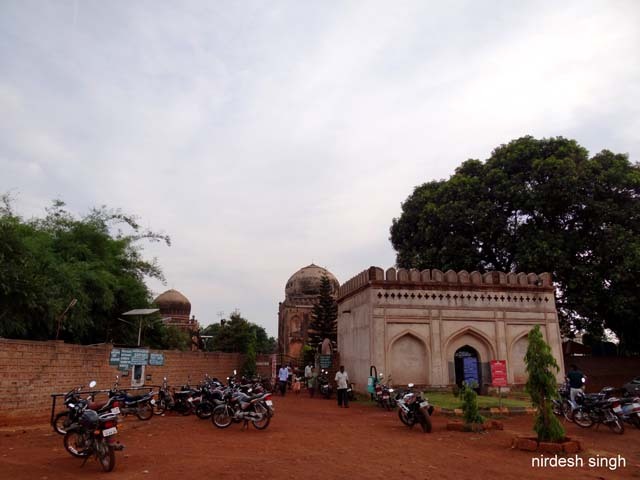 Ahmad Shah shifted the capital to Bidar in 1430 and rebuilt the old fort. Riches from different conquests brought opulence to Bidar which turned the city into a centre of culture and progress. He was religiously inclined and invited saints to Bidar. He was devoted to Hadrat Banda Nawaz of Gulbarga and later to Shah Nimat Ullah of Kirman, reportedly a Sufi dervish. He also respected the doctrine of Lingayats, a religious order of Deccan established by the philosopher, statesman and social reformer Basavanna (1134-1196). Ahmad Shah was like an earlier Akbar. The Ahmad Shah I Wali Tomb is majestic and looks solid. The walls are about twelve feet thick supporting a huge orb dome on the top. There are three doors built into huge recessed arches. The walls carry three tiers of arches of varying dimensions. 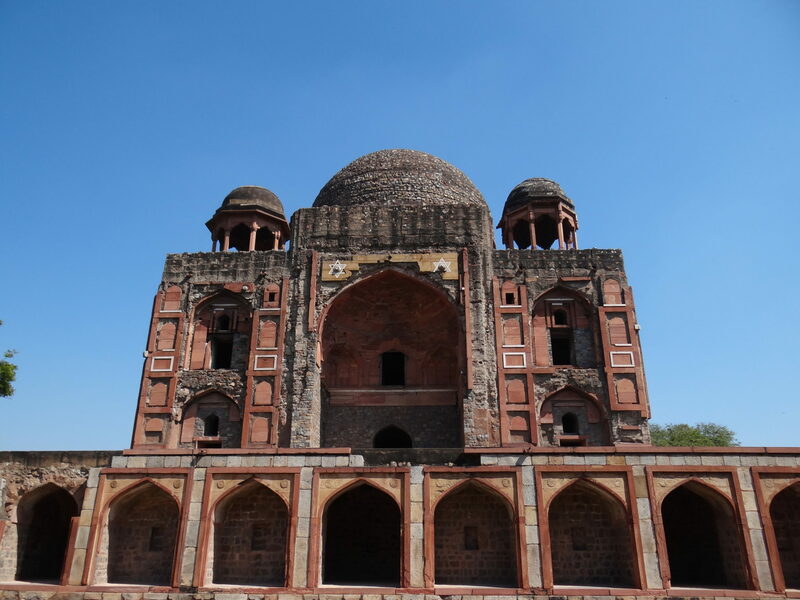 The tomb looks similar to its contemporary tombs in Delhi’s Lodhi Gardens. 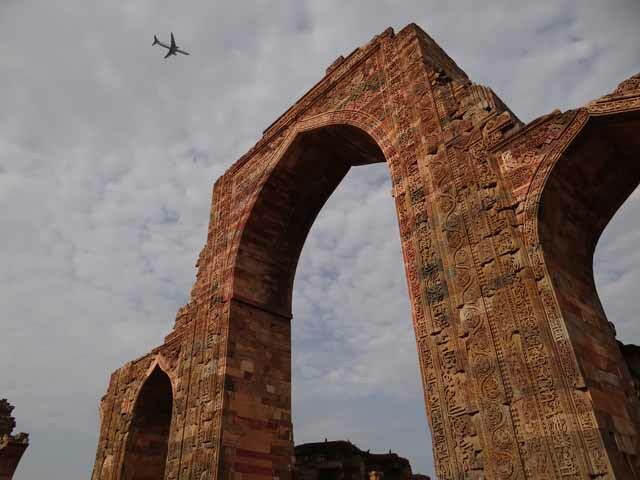 Mehrauli quickly became a hotspot for construction which continued for centuries and today perhaps boasts of more monuments than any other part of Delhi. 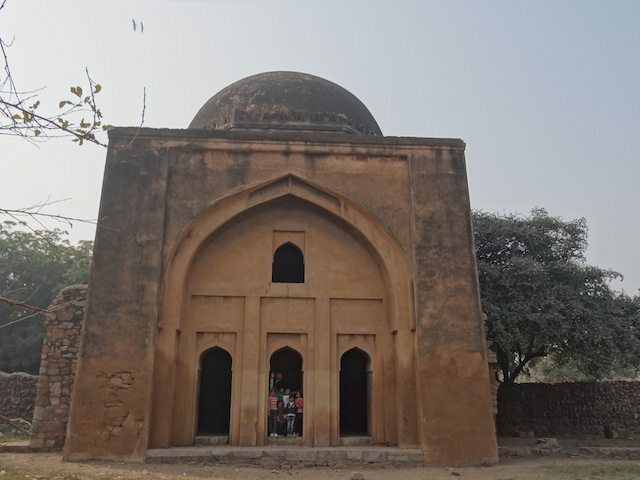 The building of Mehrauli started just a kilometre away from Fateh Burj where Ghori and Aibak entered Qila Rai Pithora after defeating Prithviraj. You have started from Bagalkot and your first stop is Badami. 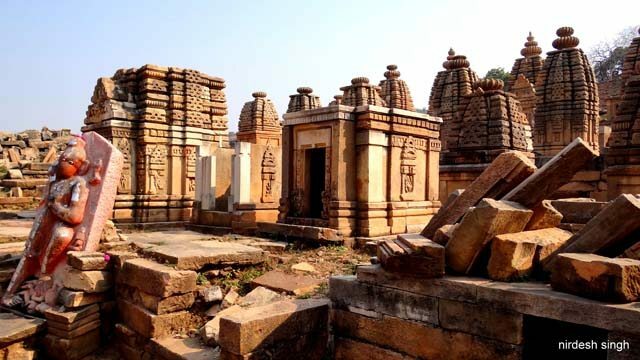 You have only one day to see the triple wonders of Badami, Pattadakal and Aihole. It is hot and the area is drought affected. You drive into the dusty town and abruptly turn left into the parking lot. The parking lot seems to be at the foot of this ravine with sandstone hills rising on either side. On the right, the red rocky outcrop rises almost vertically housing the rock-cut temples. On the top of this South Hill sits the Badami Fort. 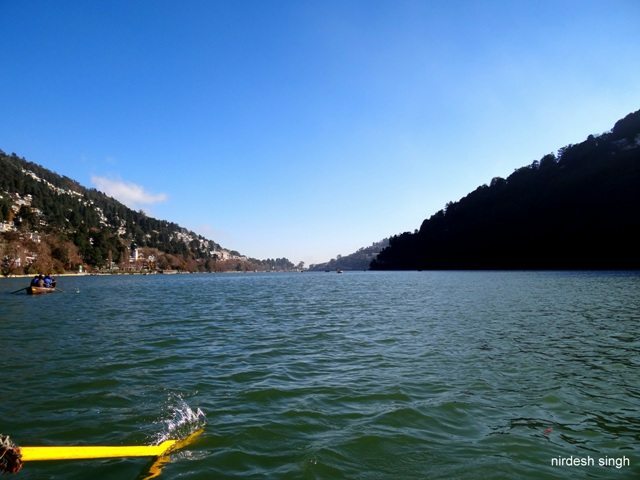 Few yards straight ahead to the parking lot is the lake called Agastya Teertha hemmed in between the two hills. On the left of the lake is the North Hill of Badami. North Hill also has fort ramparts, few temples, guard posts and the ASI Museum. The forts were initially built by Chalukyas & Rashtrakutas and then Tipu Sultan installed cannons and his treasury to the original structures. On the west, the town is threatening to push into the lake with houses built on the edge of the lake. Beware of a snarling dog that apparently dislikes city slickers and is ready to chew your neck. Into the east, you can see the Bhootnath Temple complex built on the edge of the lake with another hill rising behind it. Kids bathe in the cool lake water and women wash laundry spreading it on the steps. 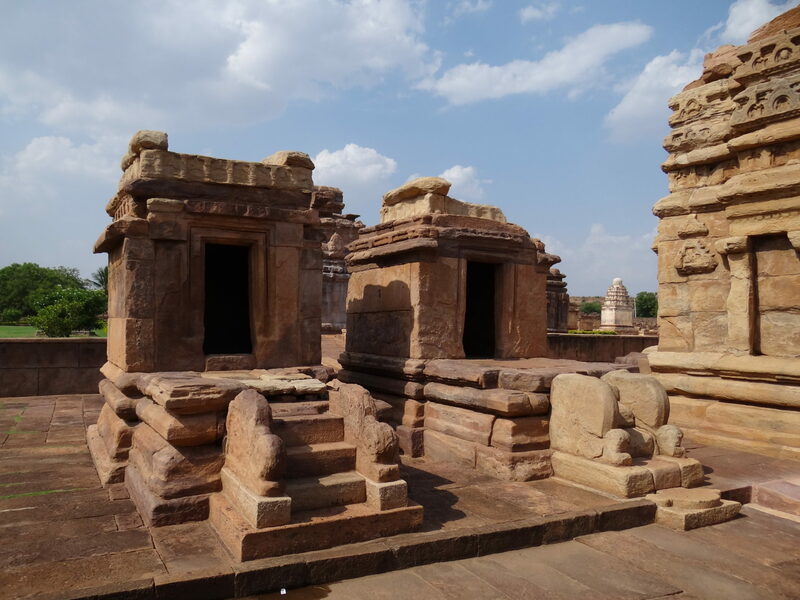 There are few more temples in the complex: There is a 7th century Suryanarayan Temple with a Rekhanagar (curvilinear) shikhar; Badiger Gudi, a 9th century Surya Temple with a stepped well and ‘Twin Temples’ for lack of any identification sign. Most of the photos carry rear views as all temples in the complex are east facing. With the low Sun shining brightly in the late afternoon western sky it was practically impossible to photograph temples from the front.